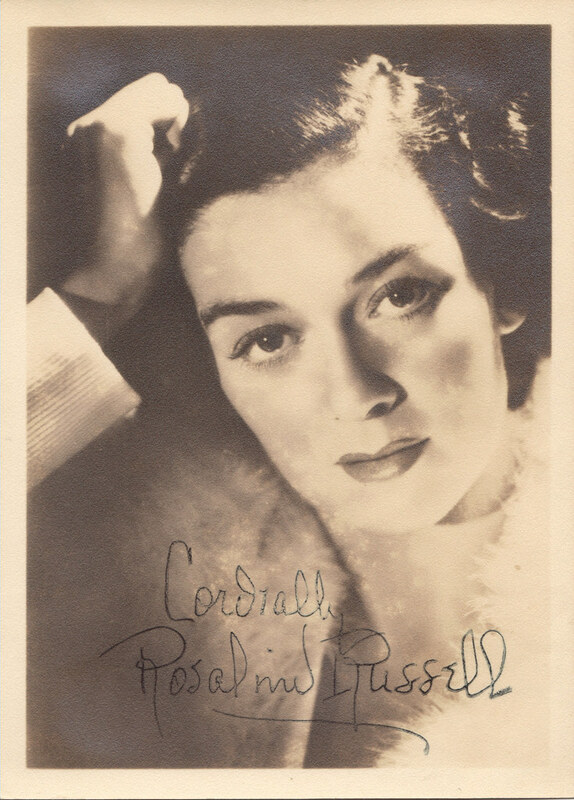 An authentic Rosalind Russell autographed photo!! 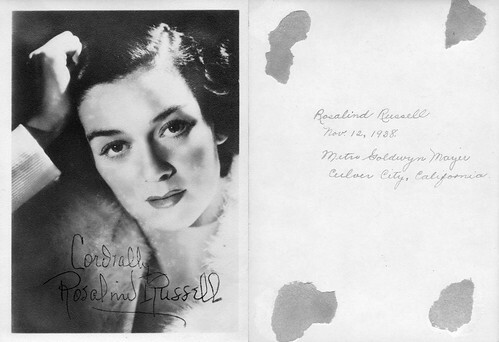 AND as if that wasn't spectacular enough for a $5 flea market find, the date that she signed the photo is my birthday! (No, not 1938, I mean November 12..) How amazing is that?!?! I was practically giddy when I found this today! If we had the proper kind of staircase, this was totally a slide down the banister while screaming "yayyy!!!" at the top of your lungs moment. Needless to say, I already made a quick trip to the craft store and Roz is now properly framed, and being displayed proudly in my bedroom. That's too great!! Luck really smiled on you for that one! Oh wow Kate, how awesome is that?! Wow that's a really awesome find. Sorry about the delay on Toby's article - I'm now doing a blog for my day job and am swamped! It will be coming asap, I promise. That is fabulous find. Enjoy! Nice work! I assume you played it cool when you spotted it, rather than let on what it was really worth... I dream of finds like this! Congratulations! That photo was meant to be with you. That's incredible. So lucky for you! Hmm, I'll give you ten bucks for it. Covers how much you paid, the frame and postage, plus a tidy little profit for you! Good for you. But if you ever find a Cagney autograph remember your ole pal. You've been nominated for a Kreativ Blogger Award here (http://anotheroldmovieblog.blogspot.com/). Congratulations. How wonderful! You're very lucky, that is such a great find. I absolutely adore Roz. always cool to find a vintage auto, especially for a price like that, but to have it signed on yer own b-day, that is now in the relam of hella-cool!